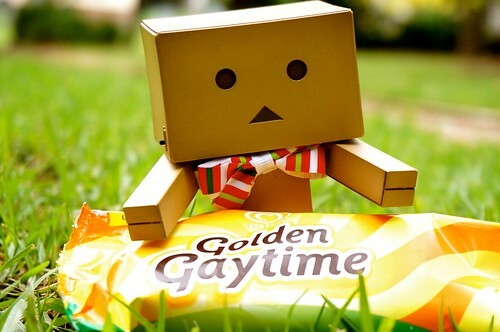 Danboard loves his Golden Gaytime! Somehow I’m the queen of subtext in my recent posts but my god if you gaiz think of other things, you are so rude! 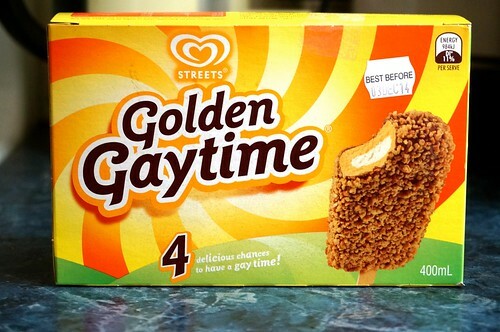 But summer is officially over in Oz and sadly, there’s no time for Golden Gaytime anymore. Unless you’re the kind who likes to eat ice cream to keep warm. I have relatives in Italy who convinced me that it’s best to eat gelato when it’s cold. Seriously. Who are they kidding? I’ll take as much chances that I can get for an awesome gay time! But what exactly is Golden Gaytime? It’s a fantastic ice cream pop sold only in Australia. It’s a vanilla pop covered in caramel ice cream with chocolate coating and honeycomb biscuity pieces. Honeycomb seems to be a popular flavour here in Australia. Must be because they’ve got quite a good honey industry here although I just saw on the telly that the bees are dying because of global warming. Anyway, bee concerns aside, I was caught by the lovely name of this ice cream which has been around when gay actually meant being happy. And you know what? It’s a lovely treat that can make anyone happy. 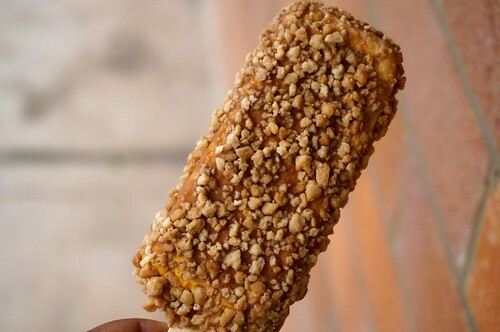 This is possibly the ice cream pop for those who love honey and caramel flavors. I wanted more crunch from the honeycomb but it wasn’t so bad that I’d hate it altogether. In fact, it’s an awesome ice cream for the summer which is now a fleeting memory in these rains. As I am the kind of person who doesn’t eat her ice cream when cold, I’ll just hold on to the memories of this golden pop.